Jerry Spencer, a former high school and college athlete, attended Union University for 3 years and graduated from University of Tennessee (MB) in 1964. He attended Southwestern Baptist Theological Seminary in Ft. Worth, TX and has been awarded a number of honorary degrees including a doctorate from Liberty University. He has been actively involved in his denomination - Southern Baptist. He served on their Executive Committee for 9 years and served as SBC Vice President. He also served as president of both the SBC Pastor's Conference and SBC Conference of Evangelist. Jerry was also inducted into the Southern Baptist Evangelists' "Hall of Faith." He has been privileged to preach in many outstanding churches such as, First Baptist Dallas, TX; Prestonwood in Dallas; First Baptist Jacksonville, FL; First Baptist Woodstock, GA; Thomas Road Baptist in Lynchburg, VA and many others both large and small. He has been a frequent speaker in conferences and conventions. 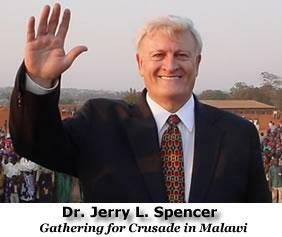 He has preached in over 100 Area Crusades in the US and in over 50 Countries. He just made his 50th trip to India. Dr. Spencer was married to Sue Walker for over 50 years. She went to be with the Lord in 2010. Jerry and Sue had 4 children: Jan Hooper, a housewife in Brownsville, TN; Dolly Ann Ezell, a nursing student in Dothan, AL; Van, who is VP of JSM and resides in Charlotte, NC; and Dan, who is pastor of First Baptist Church in Sevierville, TN. He has 18 grandchildren and 4 Greats. Jerry is presently happily married to the former Shirley Norris Robertson who has two children, Wesley and Rebecca, and two grandchildren. Jerry and Shirley reside in Savannah, TN.